Navarra is characterized by vast, uplifting agricultural landscapes and neatly manicured vineyards punctuated by romantic castle ruins and historic churches on the St. James’ Way. Apart from wine production Navarra is known as Spain’s vegetable basket and a major producer of peppers, white asparagus, chard, asparagus, cardoons and many beans. Many international grape varietals are used in Navarra, more so than other traditional regions like Rioja and Ribera del Duero, and the wine styles are quite diverse from Cabernet Sauvignon and Tempranillo blends to naturally sweet Moscatels. Highlights of Navarra would include the fairy tale hamlet of Olite, the sanctuary at Ujué, the French flavored pilgrim town of Roncesvalles, medieval Puente la Reina, cultural events like the running of the bulls in Pamplona, and the terrific wines of course! 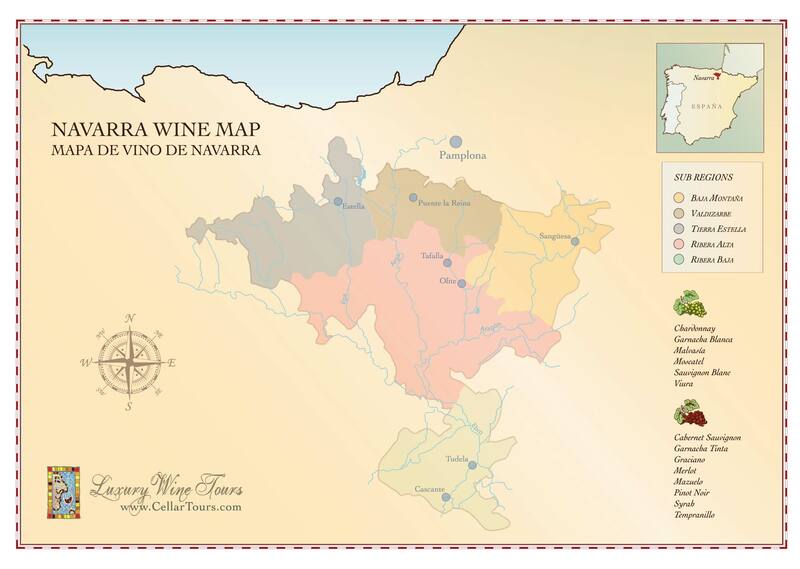 Embed Navarra Wine Region Map on your site: copy and paste the code below.